Being trapped indoors and freezing cold does make you crave comfort food doesn't it and what better way to to keep warm that a bit of old fashioned baking. As I have said before we get a fruit box delivered weekly and each week we have more bananas. Now I like a banana but there is only so many I really want and one a day for the rest of my life is probably a few too many. So I am always on the look out for ways to use up those brown ones which have been left to one side in favour of a juicy clementine or sharp kiwi. This recipe is one that I found a while ago in my trusty 500 cupcakes and muffins book but completely forgot about. I made them just as a treat with a cuppa but they would be great warm as part of a fancy breakfast or taken to work as a replacement for that oh so predictable cereal bar. Its very easy and even the most messy throw it all together of bakers, like me, can't go wrong. You will need a muffin tray, muffin cases, 2 mixing bowls and the following ingredients. Preheat your oven to gas mark 4/175C. So in one bowl mix the butter and sugar until creamed, add in the eggs, flour and nutmeg and mix until combined. Add in the mashed bananas and again mix until combined. 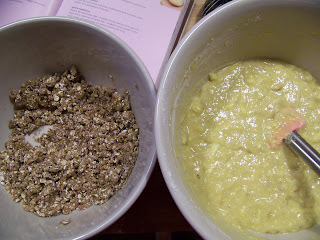 In the other bowl mix together all of the ingrediants for the topping, it will be quite a dry breadcrumb like mixture, the smaller the crumbs the better. Fill your muffin cases about 2/3 full. So here I divert from the books recipe as I find that if you add the topping here it just sinks into the mixture and you don't get much of a crunchy top. So I would cook your muffins for 5 minutes or until they are puffed up enough to fill the cases. Then quickly sprinkle on the topping mixture and continue to cook for about 20mins keeping an eye that the top isnt getting too dark. Remove from oven and leave for 5 mins to cool in the tray and then cool on a rack, or if you are like me and impatient then tuck in taking care not to burn your mouth. As modeled on my new cake rack which was a christmas present from my mum and dad, but better to keep in an air tight container for up to 3 days or freeze for up to 3 months. hellllllloooooooo! YUM! The topping sounds great! 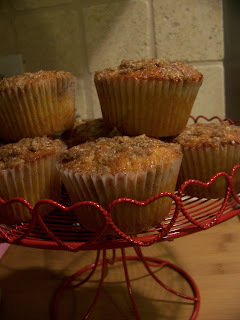 I make a similar thing in loaf form, that is apple-y with a crumble topping! choices, choices??!?!? x nb can you see the FISH/B cooking addiction?! yes it is the topping that makes it isnt it. Gonna try it on some berry ones soon too.